If you want your marine website pass filters of quality, innovation, and creativity, choose only premiumquality designs from professionals. Marine website template you see is a perfect piece of minimalistic design that will aptly present all searelated products. Here the items are supplied with short descriptions, price notification, and calltoaction buttons. Featured links and additional menu in the footer accelerate user’s navigation. Choose this design to make it a trigger for new visitors of the marine shop. How do you imagine your extreme sports web store? Cool, reserved, with great imagery and product presentation? We promise that our template will even exceed your expectations. Its main and sidebar navigation will prompt visitors the shortest paths to the desired goods. The slider and banners will help save on the current store deals. You can place any custom information you wish in three blocks arranged right above the footer. All products are supplied with descriptions, so your customers will have enough information for taking decision. The Internet is the best place for commerce now, so don’t waste time and let more people know about you. Modern people often lack movement. That is why they may feel sick, tired, and depressed. To avoid these unpleasant consequences people work out. Everyone has his orher own way of exercising. Somebody runs or walks in the nearest park, others prefer going to the fitness center, where professional trainers are always ready to give useful advice. There are people who like training without leaving their house. This template will suit all these categories of athletes. It is designed in a trendy flat style with lots of quality images, apt combination of active and neutral colors, and even custom blocks at the bottom of the page. According to our customers’ choice, this theme has been added to the chart of the Best PrestaShop Themes 2014. There are so many great ways of spending holiday or vacation, and traveling is one of the most exciting. To choose whatever destination you’re dreaming about, you visit the site with a wide range of offers. The more convenient and userfriendly it is, the more quickly you’ll find what you need. The presented theme shows an easytofollow navigation the site should possess to provide its viewers with pleasant site experience. This fishing store is hard to call an ordinary one. So, it will provide an effect of light, pleasant shock to your visitors. It’s a well known fact that even a negative reaction is better than no emotional response at all. This is especially true for eCommerce. Your online shop will advantageously stand out against the competitors with its bright design. Its layout is mainly minimalist. The author places necessary accents with the help of the coralred color. Content sections have rounded corners, which looks very welcoming. Products in the slider, on banners and in the content area look great over the white background. Many people interested in exploring the marine life choose scuba diving as their hobby. To make the most of their pastime, divers need highend equipment, that’s why manufacturers put forth maximum efforts to attract them to their goods. If you want to help companies advertize diving accessories among online audience, this template will come in handy. As scuba diving may be a dangerous activity, you’ll be able to drive away any people’s fears and arouse their enthusiasm for having fun thanks to its vivid visual peculiarities. Looking through an assortment of offerings available on your website, people will easily find any product due to its convenient layout. What can be more pleasant and healthy than a leisurely bicycle tour when picturesque landscapes surround you and fresh wind blows through your hair. This spirit of unlimited freedom is perfectly rendered by the images posted by the author of the template. The background photo is black and white other ones are colored. A super large logo is simple and easy to remember. All products offered at the store are supplied with descriptions that considerably simplify customers’ choice. So, don’t play for time, while you are doing that smarter merchants are doing business. Buy this template and join the rows of successful internet sellers. People find different types of enjoyment in fishing. Some of them get peace of mind, respite and some get a portion of adrenaline they lack in everyday life. Our template is associated with tranquil, refreshing affect of fishing. It is designed in soft, faded blue colors. Sharp edges, minimalistic typography and straight lines will be highly appreciated by male auditory. Huge numbers draw visitors’ attention. Large product images look very appealing. All of the above mentioned elements will help you increase your income several times. 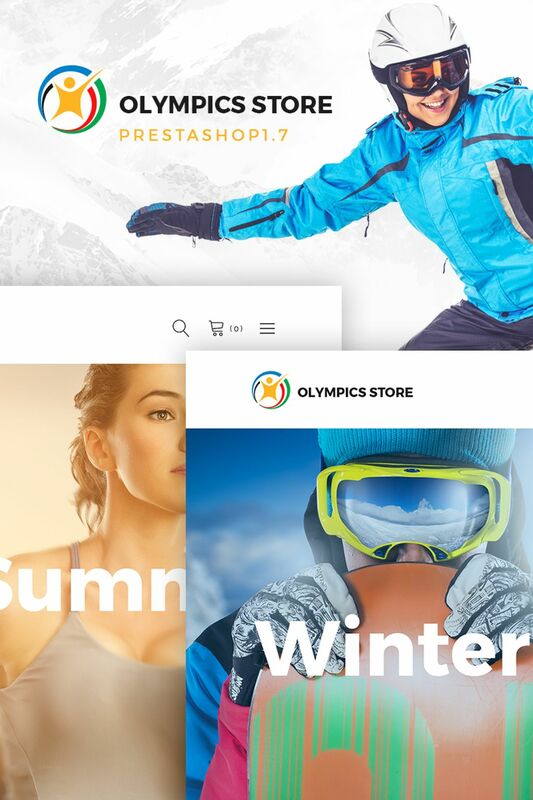 MMA Store is a modern eCommerce theme for PrestaShop-based online stores involved in selling sporting goods, car parts, and other similar products. Its color scheme and typography can be easily customized with the help of the built-in font and color pickers (you can choose from 8 color schemes and 10 web-friendly typefaces). The theme’s social media options are represented by a Facebook like block in the footer and custom sharing buttons on product pages. It also features a multicolumn mega menu, which provides more convenient navigation comparing to its simpler dropdown analogues. What’s the best way to present diving accessories? Let them look like they are already in the water. Actually there are quite a few ways how to do it either go for skeuomorphism, use amazing underwater photographs, or play with colors that perfectly communicate the underwater mood. In this template designers decided to choose the third way. Blue and its hues looks great and play well with the diving accessories. If you’re running diving store or any other marine business, this template will perfectly fit your needs. See the live demo to check out this amazing design. If you like vintage style, you’ll appreciate this template. Here the banners and photos look absolutely inimitable. Huge fonts make the text easily readable. Calltoaction buttons are rather minimalistic which imparts special charm and harmony to the concept. Text blocks of peach color are very pleasant to look at. The logo was created with the help of a handwritten font, putting a nice focus on this element. We are sure that bike riding fans will appreciate the unusual design of your store and turn into loyal customers. The tennis can be a good training for people who want to stay healthy, a great hobby for active personalities or a good career for athletes. As you see, your targeted auditory is rather large. We believe that our template’s design will be appreciated by all categories of sport fans. Shop slogans are clearly visible against blurred slider photos. A soft red color helps to draw customers’ attention to essential elements. Big, quality images of store products will help the merchant sell more items than ever before. You can get this template now or later, as you like. People lack adrenaline in every day life, so a lot of them go in for extreme sports. Such kinds of sports may be rather dangerous for human’s life. So, quality apparel and equipment are very important for athletes’ safety. Grey and white colors prevail over the template’s layout. Red elements draw visitors’ attention to the most essential content. Semitransparent text blocks look really great on banners. Top sellers in the right sidebar are supplied with product thumbnails. Additional custom blocks are placed under the featured products section. As you see, product presentation and navigation are on the highest level here. If you need a clean, functional online fishing store, you are welcome to view this page. Its slider is so calming that you feel the stirring desire to go somewhere far away from smoggy cities and sit peacefully on the bank of the lake, river or pond with a rod and just focus on the float. Maybe this day will be your lucky day and you’ll catch the biggest fish in your life. As to the store design, its absolutely irreproachable as touches both emotional and practical sides. It has simple navigation, great product presentation, lots of white space, eye candy colors and so on. Who doesn’t like traveling? Only stubborn staysathome. Most of people are ready for new experience, changing of usual environments, thrilling adventures and positive emotions traveling can give to a person. If you own a tour agency, a beautiful website with impressive images will considerably strengthen your business position. We offer you to start you site quickly with our cool template. Here your visitors will plunge into the atmosphere of vacation and recklessness. We are sure that they will wish to save these emotions as long as possible and buy a tour from you. Before beginning a new voyage, seamen make sure of having all the necessary gear at their disposal. In case of lacking something, they resort to marine equipment stores. To build an online platform for advertising items of this kind, here’s a proper theme to make use of. Due to its dominant blue color, people will believe your online store is a reliable place to shop at. Such an impression will bring them a thought that your offerings are durable enough to serve them for a long time. Tennis is an active and beautiful sport and if you sell the stuff for it, bright color scheme is preferable. This theme completely suits any of the starting or mature merchant requirements. Tennis players in action are being displayed in slider. Product collections are promoted with the help of the catching banners. Featured items section as well as all other content areas are supplied with orange buttons that draw buyers’ attention. ‘Specials’ and ‘Top sellers’ are placed in the right sidebar. Background image creates the feel of depth and perspective on the page.